Redefining what a West Coast Style IPA can be, Hammer and Ale tantalizes the senses with wonderful hop flavors and outstanding aromas, but without the harsh bitterness that characterizes many IPAs. Our recipe features a blend of three malts that provide a sweet backbone to support a symphony of hops, including Nugget, Magnum and Chinook in the brew, then finished with Simcoe, Nugget and Idaho 7. It’s basically hop candy. Our award-winning porter is like drinking chocolate milk for grownups. Rich, creamy, and delicious, it’s brewed with Madagascar vanilla beans and Dutch cocoa and served on Nitro. Roasted barley and caramel malts take the lead, with gentle Golding hops behind them. The vanilla flavor hits your palette first, with the chocolate’s roasty undertones offering the perfect counterbalance. A new twist on a time-honored tradition. 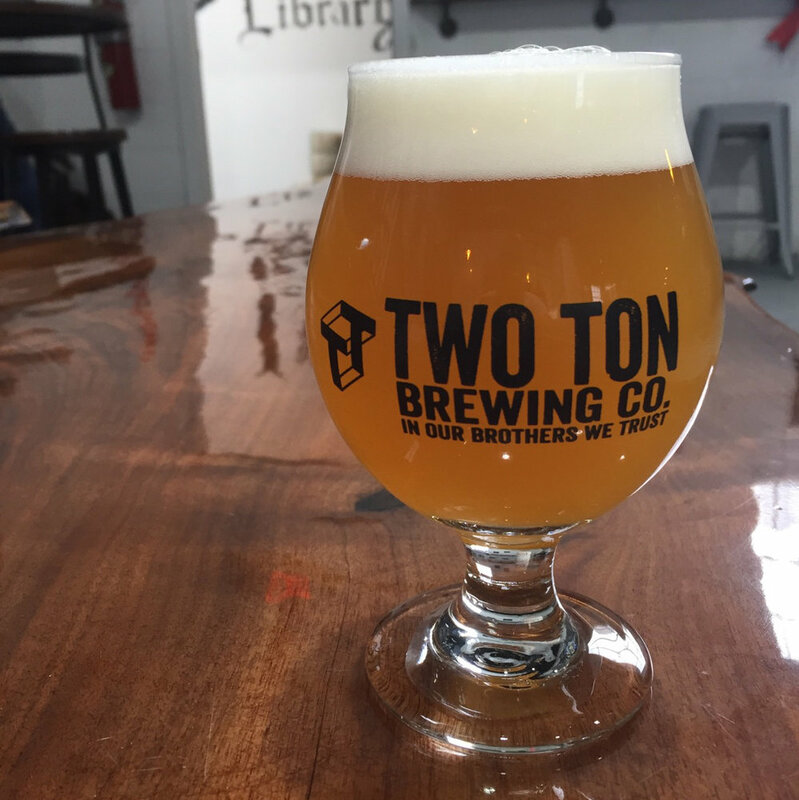 Not everything we brew at Two Ton is a heavy hitter and Wrought Gold is the perfect answer to your search for a light, quaffable beverage. This blond ale boasts smooth, round flavors of malt and slightly juicy Citra and Liberty hops, and fermented with an English ale yeast. In a time gone by, this might be called a Working Man’s Beverage, but we find it’s a popular choice for anyone who’s put in a long day. Every now and then, you have to pack the mash tun to see just how much it can hold. Or, at least, Jim does. 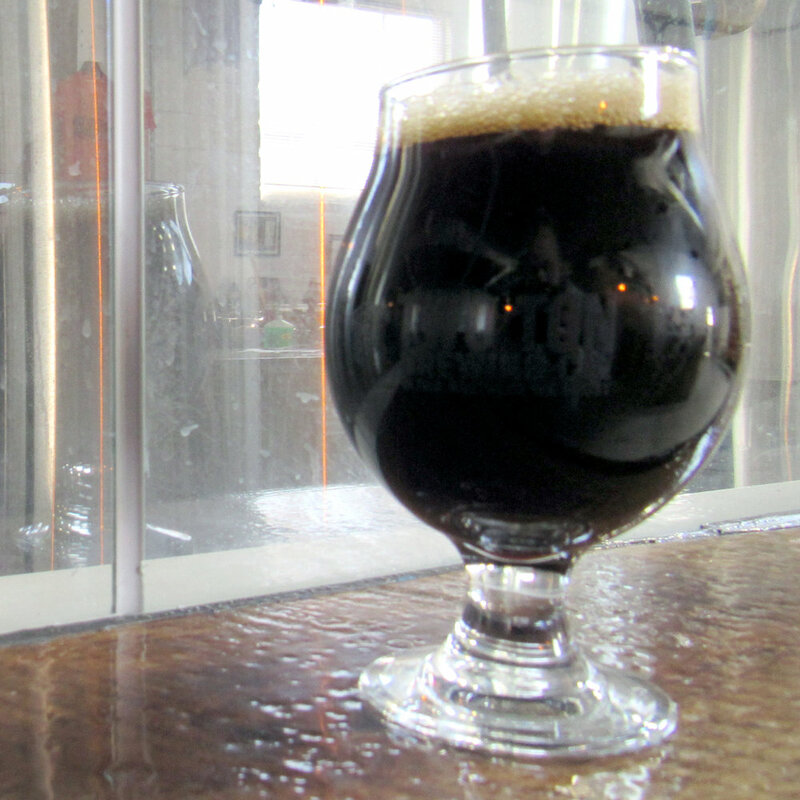 This full-bodied stout, brewed with lactose, is roasty with coffee notes. Currently available in 22oz bottles only from the Two Ton taproom. While supplies last! This double dry-hopped NE IPA features the hazy, juicy and utterly delicious hops: Belma, Idaho 7, Nugget and El Dorado. The initial flavor of pink starburst finishes like orange-mango juice, yet with intense aromas of lychee and honeydew melon. In a word ... YUM! An Altbier brewed in the style of beers from Düsseldorf. Big malt flavors are the first to greet your tastebuds, but this beer finishes exceptionally clean, dry and smooth. The twist … instead of the traditional Pilsner malts and ale yeast used in this style, we flipped the script and used ale malts and lager yeast. Verrückt! Pucker up for this one, folks! Bright flavors and bold colors abound in this Berlinner Weisse, courtesy of aronia berries and strawberry. The tangy acidity and effervescence that are typical of this style of beer will tickle the sides of your tongue, while the low ABV will have you coming back for more. A traditional German-style lager brewed with 100% German ingredients and traditional brewing methods. Hallertau Mittelfruh hops provide delicate florals and noble hop aromas, but the beer finishes with an irrefutable snap. This beer lives up to its name! Our homage to the American Pale Ale is brewed with five different grains, Cascade hop extract in the boil and was dry hopped with Idaho 7, Belma and Chinook. It was named for a fairly obscure reference to a line from Star Wars. It’s the opposite of Déja Vu. 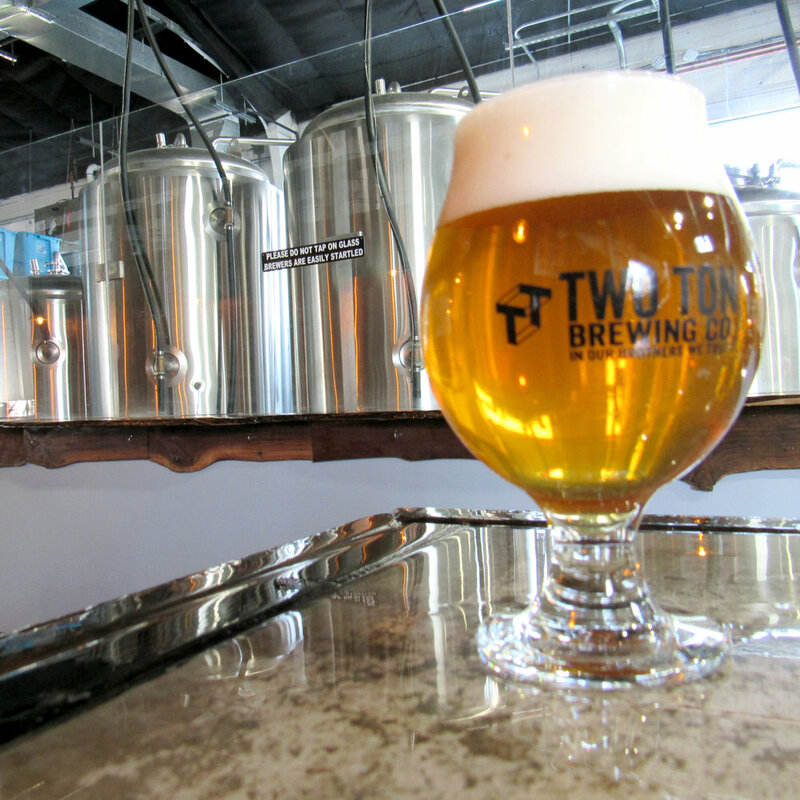 You think you’ve had a Belgian Tripel before … but we took ours in a whole new direction. Chamomile starts things off strong, but look for hints of cardamom and orange zest somewhere in the mix. And watch out … it doesn’t taste like it’s 9%! 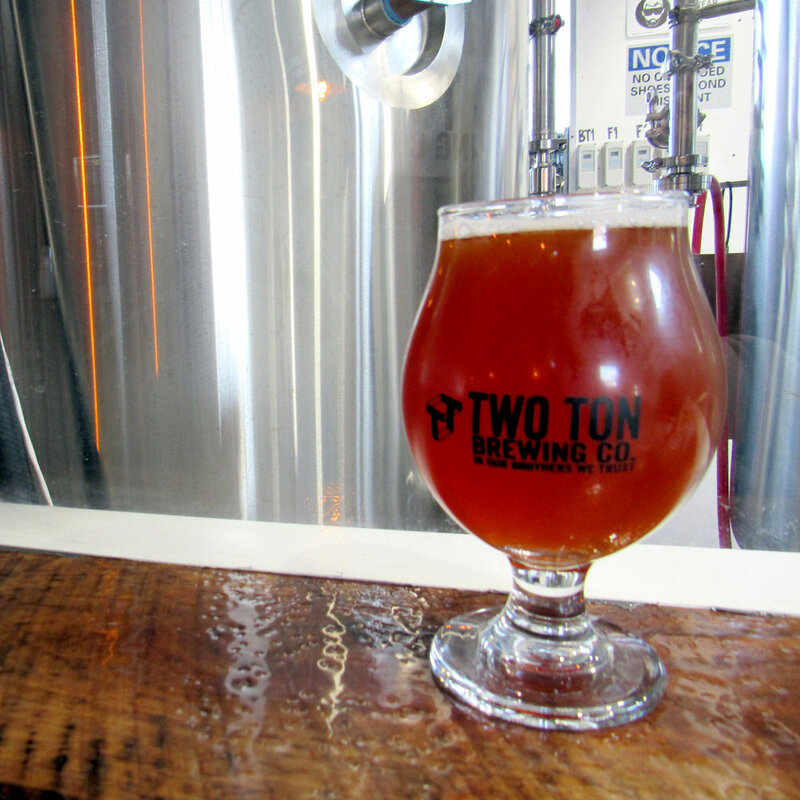 Our American style Barleywine is hoppier than its sweeter English counterparts. The robust malt profile imparts flavors of caramel, toffee and a light roastiness while the assertive hop snap conceals any boozy flavors you’d expect from its high alcohol content. This beer was aged on medium char French Oak. Remember the candy Sour Patch Kids from when we were kids? Yeah, so do we. Fondly. That combination of tart and juicy/fruity is a flavor we’ve been dying to re-create here at Two Ton. Kitty Paws began as a New England style IPA with a touch of pleasant tartness to bounce around the palate. It imparts a melon flavor like ripe honeydew and a beautifully bright yellow and hazy color without being aggressively sour. True to style, the first thing you’ll notice with this Dunkelweizen are notes of clove and banana. Following soon behind them are hints of roastiness and caramel, making for an easy drinking dark wheat beer. While this beer may have been aptly named for its release during a Mardi Gras Masquerade party, the real identity crisis began during brewing and fermentation. What started as an entirely different concept in recipe form soon became an excuse to add dozens of pounds of roasted coconut. Because honestly... why not!? And thus emerged this delicious coconut nut brown ale.